I cannot believe that this program is so bad. Before going on holiday I used the tasks in the phone for my to-do-list. While on holiday, I deleted the tasks in the phone. Back home, the tasks are back after synchronization. So, I have to delete them on the PC. I thought synchronization meant that a later edit should be kept over a newer one. I'll think again before deleting something on the phone. On the task bar in program you can choose what to edit by choosing an Editor. 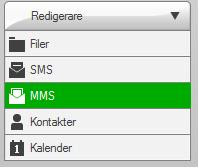 The picture is in Swedish but to translate you have the option to edit Files, SMS, MMS, Contacts or Calendar. Hey, what about the tasks? But of course, you should choose Calendar and there are your tasks. Again, an example of sloppy work with usability. Yes, you can learn this but why should I need to? Had they put in a button for tasks which just opened the calendar view they would have solved that problem without creating a separate view for tasks. I cannot copy and paste calendar entries (which I want to since you cannot delete one occasion on a recurring task) and if I change the starting time on a calendar entry the end time does not change and it's only on save that I'm prompted to change the end time in a dialogue box which could have been avoided and is avoided in for example MS Outlook. I need not go on. And to return to the issue of language, it is kind of embarrassing that a company with much of its roots in Sweden cannot make a decent Swedish translation. Redigerare is used as the translation for the word Editor (as can be seen on the image), but this is just a translation for the word when its used for an Editor for an newspaper, e t c.